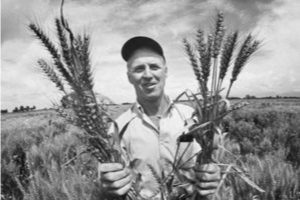 About fifty years ago, geneticist Norman Borlaug developed high-yield, disease-resistant dwarf wheat that could grow better than any other wheat. This boosted global agricultural production and they called it the Green Revolution. This wheat adopted by farming communities around the globe, plus improved rice, more than tripled the global grain yield of 0.8 billion metric tons in 1961 to 2.8 billion metric tons in 2014. Millions of people were saved from starvation and associated malnutrition that was feared based on a predicted rise in world population from 3 billion to 7 billion during that time. Today the population is expected to increase to 9.7 billion by 2050. To feed the expected new arrivals, food production must increase by another 70 percent. The Green Revolution, often made possible through direct or indirect subsidies from governments of almost all countries in the world, made grains and grain-flour products the cheapest form of food available to millions of people around the world. The result has been a significant increase in the percentage of carbohydrate-based food intake on a daily basis. It went from roughly 30 percent before the revolution to more than 50 percent in developed countries and over 70 percent in developing countries. The welcome response to an impending crisis of feeding an increasing number of people helped us save the world. Innovations in seed production, mechanized farming, improvements in milling and refining have made it possible for production of grains and grain-flours that any ordinary person could use to create a multitude of palatable and visually appealing dishes. The ease and efficiency of providing meals for the family made the gradual increase in the intake of grain and grain-based foods normal and acceptable. It has conditioned the succeeding generations to become comfortable with the idea that the daily, often multiple, consumption of grain-based foods is expected, even essential for survival. However, this has led to many unintended consequences such as increase in the incidences of obesity, Type 2 diabetes, and cancer all over the world, plus the new paradox of obesity-associated malnutrition. Thus the Green Revolution has fostered an enormous rise of serious medical conditions. What can we do? Obesity is the manifestation of consuming energy-containing foods such as grains and grain-flour products in excess of one’s immediate ability to use the energy. This then requires storage of carbohydrates inside fat cells — leading to weight gain. Type 2 diabetes is the result of the body’s burning of fatty acids instead of glucose, primarily by muscle cells, to produce energy for physical activities, resulting in the accumulation of glucose in the blood. The rising incidence of cancer is due to cancer cells multiplying faster, aided by glucose from grains and grain-flour, outstripping the capability of one’s immune system to destroy them. Obesity-associated malnutrition occurs when people overconsume cheap, subsidized grain and grain-flour products that create obesity, while at the same time failing to eat critical nutrients the body needs for proper nutrition. Solutions: I suggest the following solutions to prevent a repetition of similar problems while we try to find food for the incoming newborns. Governments should stop subsidies for grain farming. Instead they should promote cultivation of non-grain vegetable crops designed to resist pests and diseases. For example, farmers could be encouraged to cultivate heat- and drought-tolerant varieties of legumes, squash, tomatoes, and other vegetables, which should become larger parts of the diet than grains. We must promote small-scale vegetable cultivation in every possible private and public locale, emphasizing regional vegetables based on soil and climatic conditions. Educate people about the nutritional benefits of eating fruits and vegetables rather than grains. Ironically, eating fruits and vegetables that have scars on them proves survival from pest and insect attacks, and so these may be actually good for the body. Consider increased production and consumption of non-traditional nutrient-rich items such as mushrooms, seaweeds, insects, and worms. These steps will help wean people off of grains and products made with grain flours. I predict that should we do all these, we will see reductions in the rates of obesity, Type 2 diabetes, and cancer. Diabetes: The Real Cause & The Right Cure. 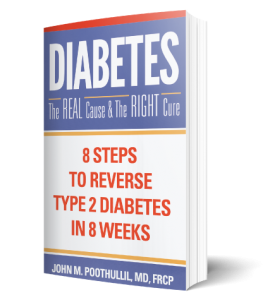 8 Steps to Reverse Your Diabetes in 8 Weeks is now available in audio format!! 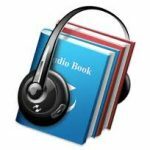 Now you can start making healthy steps while simply listening to the book!! !